Equity stock market is a reflection of the confidence of and market sentiment. Its performance relates the confidence, or the lack of it, of investors, both domestic and foreign, retail and institutions. In India, we have two major equity indexes: BSE's Sensex and NSE's Nifty. While the NSE is India's largest stock exchange by turnover, it is the Sensex that is more famous the world over. It is debatable if stock market performance is a barometer of a country's economic health. However, it is true that it does, in most cases, reflect the fundamental strength of the underlying economic fundamentals. 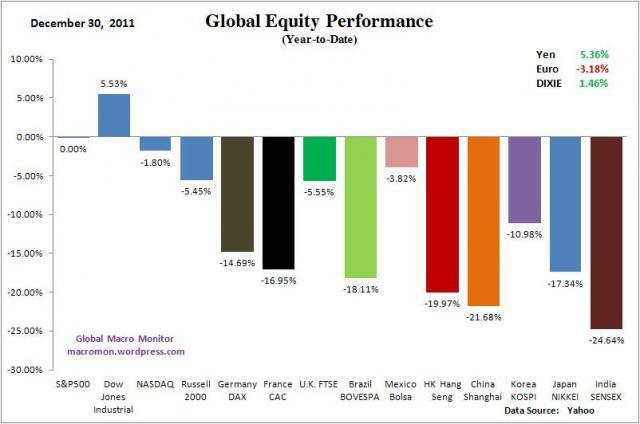 I found the chart below on global equity performance at the Global Macro Monitor blog. (a) The NYSE's Dow Jones is the only stock index to have closed 2011 on a positive note, i.e. at a level higher than end-2010. (b) The DAX (Frankfurt) and the CAC (Paris) indexes in the huge debt-laden eurozone economies have performed poorly, down nearly 14 and 17 per cent respectively; uncertainty has gripped the euro economies what with debt worries plaguing almost all major economies in the single currency zone. (c) Three of the four BRIC economies did worse: Shanghai down by over 21 per cent (where majority of listed companies are government-owned), Brazil by 18 per cent, while India's Sensex ended up as the worst performing equity index in the world. Currently among large economies, India is the second fastest growing economy. However, investors in the listed companies on the Sensex collectively lost a Rs19 lakh crore in 2011. In 2011, the Sensex fell by a total 5,054.17 points or 24.64 per cent in the entire 2011. In comparison, the index had gained 3,044 points (17 per cent) in the previous year 2010 and by even a wider margin of 7,817 points (81 per cent) in 2009. The major reasons for the pathetic performance of the Sensex (and the whole Indian equity market) are: political instability at the Centre, the UPA's bad decision-making, lack of confidence-inspiring reforms, populist spending, rising fiscal deficit, eurozone crisis, rising inflation, volatile energy prices, international political uncertainty, and above, uninspiring leadership at the head of the government, led by Dr Manmohan Singh. Labels: Business, China, Europe, Infographic, Politics, U.S.
Bharat,please do a write up on the difference between Nifty and Sensex too.